A small charm can fit a couple of words. The medium or large charms can fit a few words of text. If you have selected not to have a paw print kit sent because you have an image or photo of your dog's paw print, please upload it here. 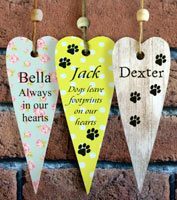 Dispatched within 4-6 weeks of the order being placed or receipt of your paw print(s) if the postal kit is used. These wonderful personalised paw print charms are totally bespoke pieces of jewellery featuring your dog’s very own paw print. 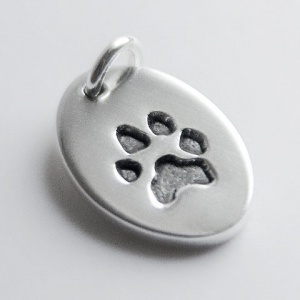 Pure polished silver charms made just for you featuring your dog’s own paw print plus an engraved inscription on the back. 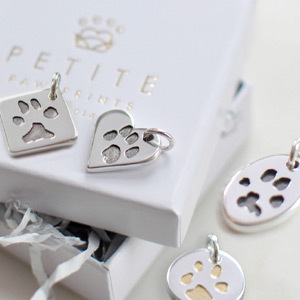 Each piece of jewellery is handmade and totally unique to your dog, creating the perfect gift or keepsake. 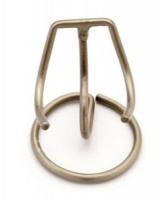 These charms are quality 99.9% pure polished silver with optional 24ct gold inlay. Every piece is stamped with the registered hallmark; 999 for pure silver, ensuring a high standard of quality with every charm as standard. Included is free engraving on the back of each charm. 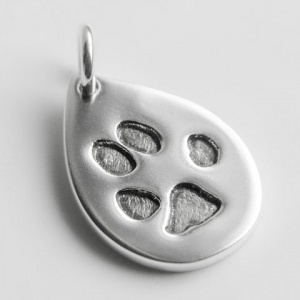 Capturing your pet's paw print in silver forever couldn’t be easier. 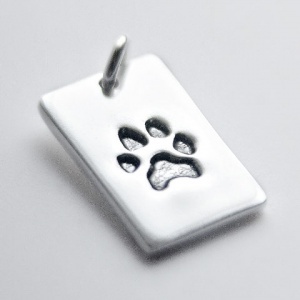 When you place your order you can upload an image of your dog's paw print or even a photo of their paw. Alternatively, select the free print kit option (inkless non-toxic wipe and sensitised paper), allowing you to take your pet’s print at home. You can take several paw prints from which the best will be used. Return the print(s) using the pre-paid envelope provided. 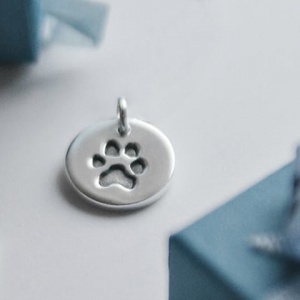 Your dog's paw print will be miniaturised, ensuring that all the fine details of the print remain and then transferred into the silver, creating your bespoke charm. For the engraved inscription on the back, a small charm can fit a name and date or alternatively a couple of words of text while the medium or large charms can fit two names and a date or a few words of text. A sample of the engraving is shown to the right but please note that it is done by hand so there will be slight variations to the style of the writing. 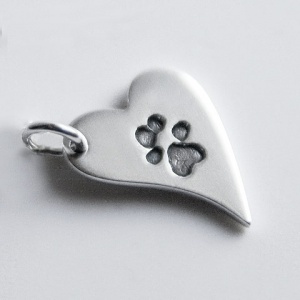 At no extra cost you can have 2 paw prints on one charm, if you like. 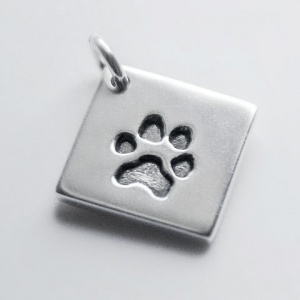 This option is available for medium or large charms, as they can accommodate up to two paw prints on one charm. 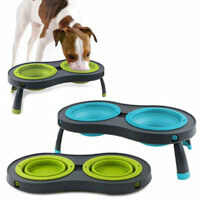 This is a nice option if you have two dogs or want to do one dog’s left and right paw. 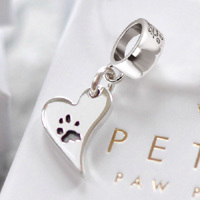 But please note that, if you choose to have 2 paw prints on one charm, the prints will be significantly smaller than if there was a single paw print. If you select to have two paw prints, please include a note near the prints telling us which paw is to go on the left and which on the right. Each item is beautifully gift wrapped. The perfect keepsake to treasure forever. These charms look great on a necklace, charm bracelet or whatever you choose to put it on. Prints are not restricted to dogs. Cat lovers can have their pet's paw prints done too. For an extra cost you can choose to have the print inlaid with 24ct gold or rose gold. 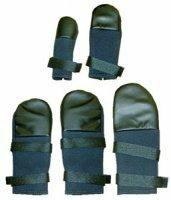 Please note that sizes are approximate and measurements can vary slightly due to each one being individually handmade. Oh my God I am totally speechless. Received my small rectangular pendent yesterday and it is amazing. The attention to detail, the obvious loving care that has gone into making this. My dog is still with me but I wanted to have something that I could keep forever and this is perfect. Cannot praise the company enough. From start to finish they kept me informed. Thy even sent me a fresh piece of print paper when I did the typica man thing and didn’t read the instructions properly. Really impressed. I ordered 3 of these and they are adorable and very well made. 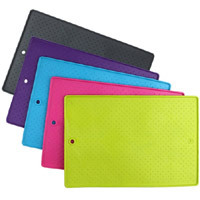 I would highly recommend them for a gift or even for yourself! Well worth the money! I lost my little dog a few weeks ago and ordered the funky heart charm to put on my necklace. 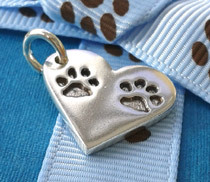 It is perfect, his little paw print on the front and his name on the back. I will wear it every day, it is such a comfort. Thank you so much. Lovely quality and beautifully presented,can’t recommend highly enough. I ordered this as my beloved boy had just gone over the bridge. I only had a photo of his paw which was overgrown and Jo managed to clean it up and make the item. Exceeded my expectation and is very high quality. I have had many a compliment about mine. My sister lost both her beloved dogs earlier this year and with her 50th birthday coming up, this was the perfect gift. 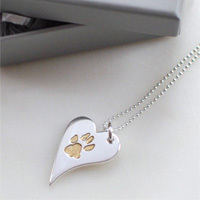 The quality of the charm and the paw prints is excellent and so was the service. As the dogs were no longer with us, all we had were their paw prints set in clay so wasn't sure if it would even be possible to have the charm done but after speaking to the kind and lovely Jenny i took photos of the prints and emailed them over in the hope that they could be used. A few weeks later this beautiful charm arrived, complete with personalised engraving on the rear and now hangs proudly around my sisters neck. 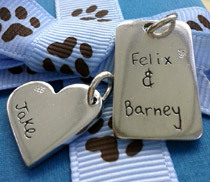 The charm is priceless to her and will be treasured forever.The absolute perfect gift for dog lovers. Thankyou Jenny and D for Dog. 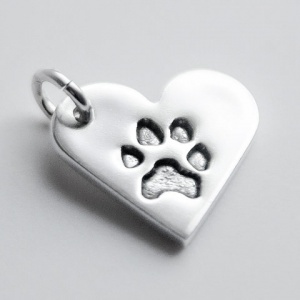 I bought one of the personalised paw prints charms of my eldest dog. I was so enraptured by it, that I also ordered one of my new pup. They are beautiful and a great keepsake of them both. If I ever get another pup (husband says no!) I would definitely order another. I've just received my charm and it's so much nicer than I ever could have imagined. I would highly recommend it to anyone looking for a special keepsake. Arrived promptly and looks great. Very pleased with the service.